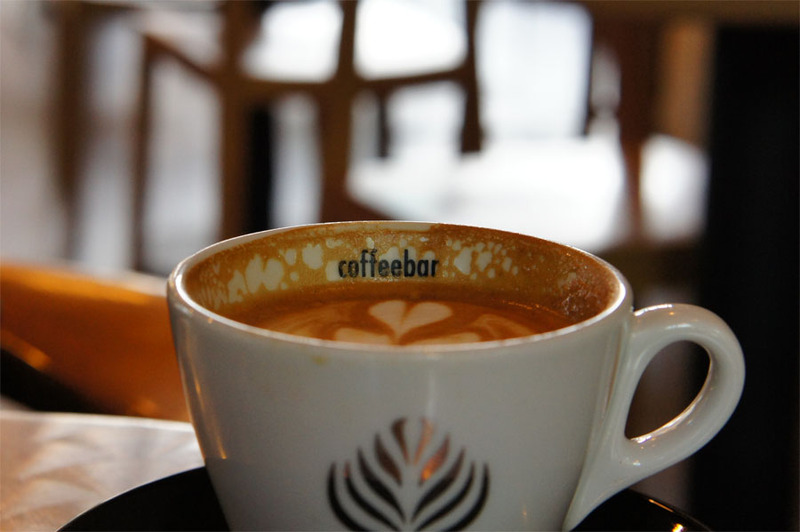 "Coffeebar is an architect designed space dedicated to fine espresso, house baked treats." Located on the ground floor of an old gas station built in the 1930s, Coffeebar has designed their renovated heritage space with a modern touch taking advantage of floor to ceiling windows bordering most of the cafe. Started as a project by Tao Designs a Dubai-based interior architectural design firm, Coffeebar provides a unified design from the seating, to the lights, to the ceramics. 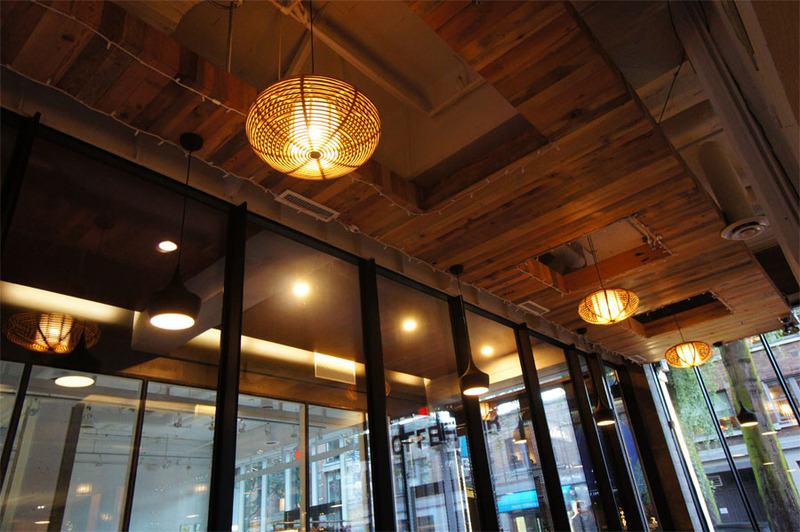 Like most new retail spaces built these days the ceiling is painted white with an exposed HVAC system, but Coffeebar breaks it up using a suspended wood ceiling installation. There's lots of seating in the front of the cafe while a small corridor alongside the kitchen leads to a few seats in a back corner of the space looking onto a courtyard. 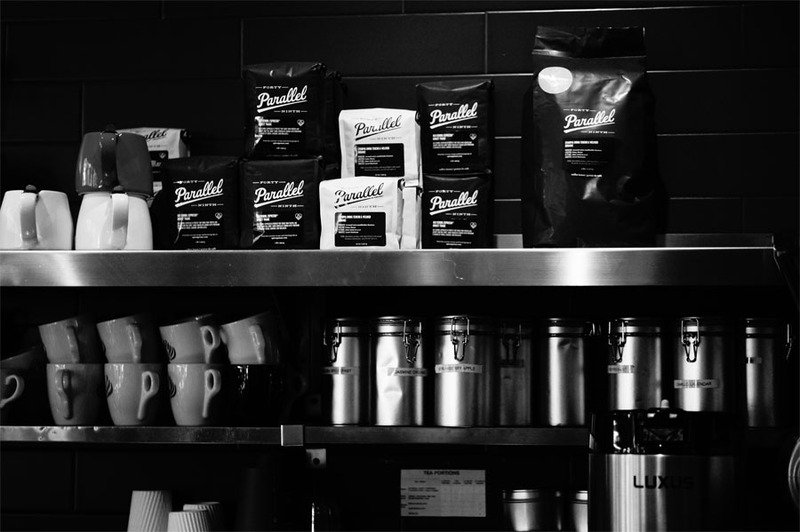 Coffeebar uses beans from 49th Parallel Coffee Roasters with drip coffee and espresso drinks made on their three lever group equipped Kees van der Westen Mirage Idrocompresso machine. Along with baked goods that get prepared every morning in the cafe, Coffeebar also has a mix of sandwiches and salads for lunch. The building at 12 Water Street was built in 1930 and originally a gas station and parkade operated by the Nagle Brother as part of the Home Gas network of service stations in Western Canada. The architects for the building was McCarter and Nairne as a two story concrete structure. During the Gastown street scape reconstruction in the 1970s the garage building also received significant renovations to add retail and office space by architect H.T.D. Tanner. The most recent renovations were part of a project by the Salient Group in 2009 to add three additional stories of residential to the garage building while also incorporating renovations to several buildings located next door owned by Salient. The renovations in 2009 were done by Acton Ostry Architects. "The design was to have a very modern, simplistic feel. It was applied to signage, coffee cups, stickers, napkins, etc. For an espresso connoisseur, this symbol will be a recognizable one. The client wanted to express an upscale, somewhat exclusive feel with the brand." The black lamps in the cafe are part of a collection from British designer Tom Dixon called Beat Lights. Made of spun brass they are fabricated in the northern India city of Moradabad which is nicknamed the "City of Brass" because of their fabricating industry. The collection is sold locally down the block on Water Street at Inform Interiors. "A series of lights inspired by the sculptural simplicity of brass cooking pots and traditional water vessels on the subcontinent." 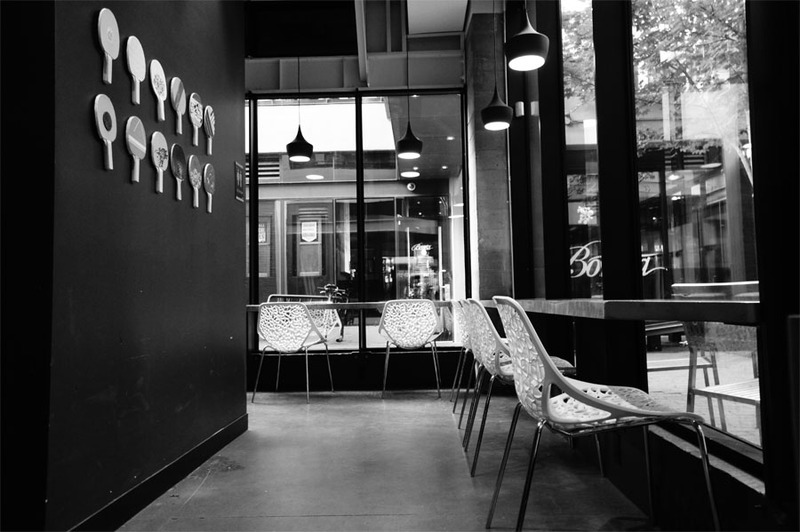 Nabob Coffee Company is a Canadian coffee brand that was started in Gastown by Kelly, Douglas & Co. in 1896. After originally operating at 123 Water Street they later opened a new warehouse at 375 Water Street (now known as The Landing office building). Nabob was purchased by Kraft Foods in 1994. Three years later, Nabob Coffee's Lake City, Burnaby facility was closed by Kraft. The building is now used by Swiss Water Decaffeinated Coffee Inc. which was originally the decaf division of Nabob Coffee. The black benches in the front of the cafe were designed by Kristian Thorson who is an artist and designer currently residing in Vancouver. He was also a member of the Blue Man Group for several years in Chicago and New York City.